A man’s gotta have pants. 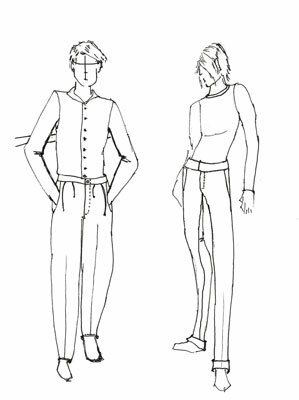 You can draw dozens of different looks for men’s pants. A well-dressed guy turns heads. Fit is important when you’re going for a tailored look, and for students, the style is all about going slouchy. Either way, you’re allowed to have fun with guys’ fashion pants. Men’s pants differ from women’s mostly in the fit and in the subtle details such as the pocket locations and the length of the center front fly. Guys of all ages love cargo pants. Who wouldn’t love the comfortable, casual look of cargos — not to mention all the extra places for carrying keys, wallets, and cellphones! Cargo shorts are just cargo pants cut off right below the knee. Start with a guy in a front pose. Or if you really want to show off the features of cargo pants, draw a three-quarter or side pose; these poses allow you to show the pockets on the side of the pants. 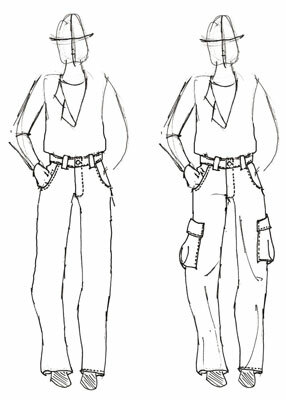 Draw a basic pair of pants with a waistband, belt loops, topstitching, and a fly. Add cargo pockets to the side of each pant leg, with the tops of the pockets about midway between the waist and knee. You can add more than one cargo pocket on each leg. Finish the pants by adding a few lines around the knees and hems to show the baggy look of the pants. Hidden side seam pockets: A hand slipped inside the pocket shows that a pocket is present — skip the topstitching here. Pleats in the front: Between the fly and the pockets, draw a couple of short, slightly curved lines extending down from the waistband. These lines should be no longer than the length of the fly. Tab closures: Trendier pants may not have pleats (this pleatless style is called a flat front) or belt loops; such pants may have a tab closure instead of the traditional button fly. To draw a tab closure, simply add a solid, vertical line on the waistband off to one side of the center front line, opposite the J shape of the fly. Creases down the center front of each leg: The crease is more prominent from the hem to just above the knee. Cuffs: Dress pants often have cuffs. To distinguish dress pants from other types of pants, include at least two or three of these details. Of course, your fashion model’s shirt and shoes also help the viewer know that he’s dressed for a more formal occasion. Everywhere you look, you see guys in jeans. Relaxed-fit jeans, which are worn at casual workplaces and serve as a weekend uniform for relaxing and partying, are a guy’s classic pant. You draw khakis similarly to jeans — the main differences are the fabric used and the smaller topstitching lines in khakis. If you’re not drawing in color, distinguishing between the two is hard. Men’s jeans and khakis have the same lines and similar detailing as women’s. The difference comes down to the fit. Men have boxier bodies, so guys tend to wear their pants relaxed and straight leg. Keep the waistband relaxed and located slightly below the bellybutton with the pant legs going straight down. Draw the lower half of a guy in a grounded three-quarter pose. Focus on the fit. Keep the side seam and inseam lines straight or somewhat baggy for a relaxed look. If you’re drawing khakis, put less emphasis on the topstitching. 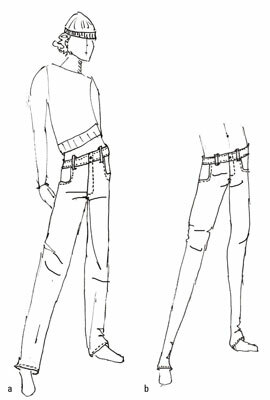 To get the emo tight-jean look, draw the waistband lower on the hips and make the side seams follow the shape of the legs. Include all the same jeans details but make the hem of the pants tight around the ankle.